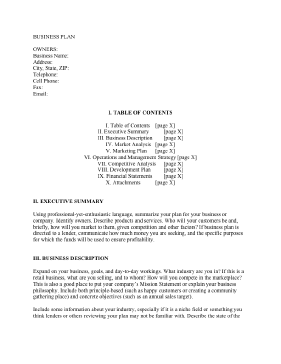 This Startup Business Plan Explanatory Text provides you an outline for your business plan, as well as detailed information about the kind of material that belongs in each section of your plan. Using professional-yet-enthusiastic language, summarize your plan for your business or company. Identify owners. Describe products and services. Who will your customers be and, briefly, how will you market to them, given competition and other factors? If business plan is directed to a lender, communicate how much money you are seeking, and the specific purposes for which the funds will be used to ensure profitability. Expand on your business, goals, and day-to-day workings. What industry are you in? If this is a retail business, what are you selling, and to whom? How will you compete in the marketplace? This is also a good place to put your company’s Mission Statement or explain your business philosophy. Include both principle-based (such as happy customers or creating a community gathering place) and concrete objectives (such as an annual sales target). Include some information about your industry, especially if it is a niche field or something you think lenders or others reviewing your plan may not be familiar with. Describe the state of the industry, and any predictions as far as growth and change in the coming years – and how your company will adapt to or capitalize on these changes.